Richard completed a BBiomedSc. at UNE, followed by a BSc. (Hons) looking at the expression of a number of key immune proteins in Coeliac Disease. He has recently completed his PhD in Immunology investigating ways to improve the diagnosis of Coeliac Disease. Human physiology: gastroenterology, immunology and haematology. 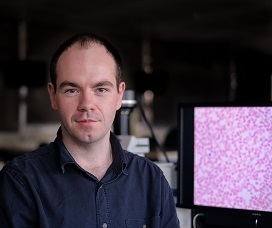 Richard’s main research interest is in mucosal immunology, examining how the innate and adaptive immune systems interact with exogenous antigens on a daily basis. His research is also focussed on the implementation of statistical modelling and prediction algorithms to improve the diagnosis of autoimmune disease. Recently, Richard has also developed an interest in the influence and effects of the gut microbiome on the brain and central nervous system through the immune system. Charlesworth, R. P., Andronicos, N. M., Scott, D. R., McFarlane, J. R., & Agnew, L. L. (2017). Can the sensitivity of the histopathological diagnosis of coeliac disease be increased and can treatment progression be monitored using mathematical modelling of histological sections?–A pilot study. Advances in Medical Sciences, 62(1), 136-142.